Adapted from a series of weekly manga publications of the same name by Kazuo Koike, the saga of Lady Snowblood takes the storied tradition of samurai revenge cinema and puts a umbrella with a hidden sword in the hands of an enigmatic, ethereal woman with pale skin and piercing eyes. The grace and darkness embraced by Meiko Kaji in the title role transforms into a real sight to behold while channeling vengeance through her stern presence, as the quickness of her blade swipes and the spatter of blood upon her crisp, colorful robes leave memorable marks upon the genre. Directed with precision and raw impact by Toshiya Fujita, both films -- Lady Snowblood and Lady Snowblood 2: Love Song of Vengeance -- command a sense of style that becomes its own form of visceral poetry, expressing plenty about the accursed soul whose upbringing and training left her with little but her bloodlust. That she's become an icon of cult cinema and an influence upon contemporary films about systematic revenge shouldn't be a surprise, even if the bulk of Lady Snowblood's reputation lingers in spite of a merely adequate sequel. Director Toshiya Fujita uses lingering shots of saddened eyes, tremulous camerawork amid brisk motion, and vivid shades of blood red while telling the solemn story of the Lady Snowblood, known also by Yuki Kashima (Meiko Kaji), an orphan whose family was destroyed by the wicked actions of a group of murderous con-artists. In the brief moments after childbirth when the two were alive and laying next to one another, her mother (Miyoko Akaza) assigns newborn Yuki an unholy task before dying: to exact revenge on the group of people who killed her husband and forced her into a life of destitution and imprisonment. Barely an adult, after years of training with a priest who educated her in the ways of being an assassin, Lady Snowblood finally decides that the time's right to hunt down her targets at unclear points across 1880s Japan. Unfolded through a series of chapters, her tale follows the successes, disappointments, complications and bloody dust-ups that occur during her search, including what happens when a telling of her murderous fable makes it into a print publication. 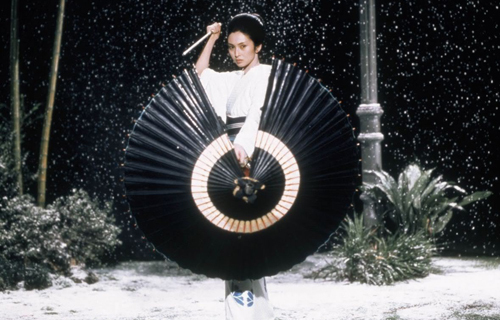 Skewed, elevated camera angles and iconic images featuring falling snow and crashing waves amplify the visual tempo of Lady Snowblood, crafting a vivid portrait around a woman on the outside of human existence who's driven only by her predetermined vendetta. The fierce, distant look in Meiko Kaji's gazes as she stands against beautifully-photographed locations only enhance her character's detachment from the simple joys of this world, appreciating only the blood she spills against the wintry whites and nighttime tides. And blood she spills, indeed: brisk, credible swordplay sends buckets of the stuff and limbs flying throughout her raucous pursuits, underscoring a lot of hyper-violence that welcomes the artfully cartoonish tempo dialed up for the audience's delight. There's a style-over-substance imbalance here, accompanied by jazzy music that includes vocals from Meiko Kaji herself (which should be familiar to Kill Bill fans), yet the components of Yuki's story -- the bleakness of her past and her singular, fated purpose for being -- elevate the outlandish attitude with a gripping, consequential motive behind it. That bloodshed and those stoic responses to her surroundings are the only real glimpses offered of Lady Snowblood's personality -- or lack thereof -- aside from flashbacks to her family's past and to her systematic training, an unpretentious montage of her transformation from a embittered girl to a surgical killer. Enlivened with striking still shots of historical paintings and sepia-toned photos that transition to in-motion color for effect, the jumps between time periods in Lady Snowblood form into an abstract style of implicit character examination as they're inserted within the chapters counting down to her endgame. In fact, the film spends more time fleshing out who her targets have become since their evil deeds than directly touching on what kind of person she might be. That, of course, is intentional: while establishing complex identities for these villains, some who are thriving and others who have fallen into grim circumstances, the question lingers as to what'll be left of Yuki's life after, or if, she's successful in her mission. Lady Snowblood builds upon that curiosity throughout its twisty and volatile final chapter, ending in a grand display at a lavish masquerade ball that underscores the troubled, war-focused state of the country that contributed to the demise of her family. Director Toshiya Fujita comprehends what kind of thematic implications hang in the chilly air at the end of Lady Snowblood's journey, matching the brazen and unpredictable climax with a fittingly melancholy tone. How could this half-demon shaped into a weapon of murder and vengeance, who deliberately suppressed her emotions and her decency for so long, learn how to live a normal life after she's fulfilled her vow to her slain family? It's a question better left as rhetorical than directly answered, and that's precisely why an open-ended -- albeit highly suggestive -- conclusion works as well as it does at the end of Lady Snowblood: there's no telling who Yuki could, or would, become since so little is known about the person underneath those harsh features and that crafty umbrella. Alas, in order for Lady Snowblood to have any kind of direct sequel, the ambiguity of the first film's ending must be addressed in one way or another. Love Song of Vengeance answers a few specific lingering questions by wrapping Yuki Kashima up in yet another conflict without a choice in the matter, one hinged on increased political turmoil and the repercussions of her vengeance. After being hunted, captured, and sentenced to death by the authorities for her rampage, she's liberated by a secret police organization that has a different objective in mind for her: to exploit her capabilities and her dire situation to force her into locating a significant document in the possession of an anarchist, Ransui Tokunaga (Juzo Itami). Obtaining the document and bringing it to the secret police's leader, Seishiro Kikui (Shin Kishida), will grant Lady Snowblood a pardon for her crimes; however, her time monitoring this anarchist provides another point of view, another layer of political concern, toward the decisions she should make. Since none of Lady Snowblood's prior enemies remain after the character's ruthless crusade, Love Song of Vengeance must contrive an alternate situation requiring her special set of skills, one that takes the political undertones of the original film and expands them into the central plot. Despite the aesthetic similarities between the two, the close-up shots of impassioned eyes and the raw shakes of the camerawork during far more spread-apart battles, this new focus also alters the tone of Toshiya Fujita's direction and loses its grip on what makes Lady Snowblood so gratifying. While the story suffers from the classic symptoms of a tacked-on sequel, from blunt explanations that justify the new setting to the conditions that get our antihero wrapped up in another complicated situation, it also has a difficult time merely refocusing the tone and energy of the original into these new political maneuverings. Switching out much of the carnage for elements of political intrigue does make Love Song of Vengeance a more mature experience, but it also subtracts from some of the vivid artistry from the original. There are scenes featuring Lady Snowblood engaged in combat, of course, which tap into a bit of the familiar vigor one might expect from this sequel, but the bulk of that action in Love Song of Vengeance -- heavy at the start and finish, sparse everywhere else -- essentially bookends the film's political deviations. Instead, scenes of bloodshed caused by our heroine's blade are replaced with the repercussions of torture, torment, and destruction at the hands of higher authoritative powers, fitting with the heavier dramatics present in Toshiya Fujita's film yet decidedly less jubilant. It could be argued that the process of Yuki learning about Ransui Tokunaga, his anarchistic movement and the plight of the people exist as a means of giving shape to the former assassin's personality without her storied vendetta driving her spirit. Yet, that absence of personal revenge leaves a void in the Lady Snowblood mythos that cumbersome espionage and political retribution can't properly fill, and when the sequel does return to its gory form in another chaotic ending, it doesn't feel nearly as personal this second time around.